Andrew and I arrived about 10am and there were already a bunch of amateur radio enthusiasts set up with giant antennas for their field day. 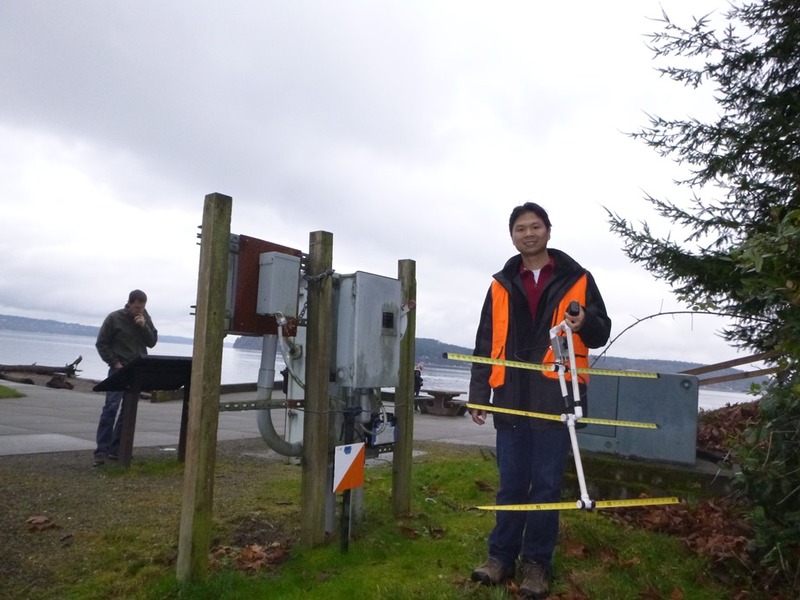 I found the Transmitter Hunt guy, and he gave us a homemade antenna and gave us a 1 minute tutorial on how to use it. Basically, you set the radio to the frequency of the transmitter, then you sweep the antenna all around until you get the signal. You then adjust the attenuator until you only get a signal in the direction of the transmitter. Then you just walk toward the transmitter repeating the steps until you find it. Andrew and I excitedly took our gear and started off toward the transmitter. As we walked, we discussed how walkie talkies worked and about radio waves. The transmitter would only transmit some morse code for 30 seconds, then turn off for 30 seconds, so we would pause or walk slowly while the transmitter was off. Then when the morse code started beep beep beeping, we would scan with our antenna and started walking quickly toward the signal. The first transmitter was only about a hundred meters from the main station and we found it within 5 minutes. It was exciting nonetheless. We started walking down the beach toward the signal. 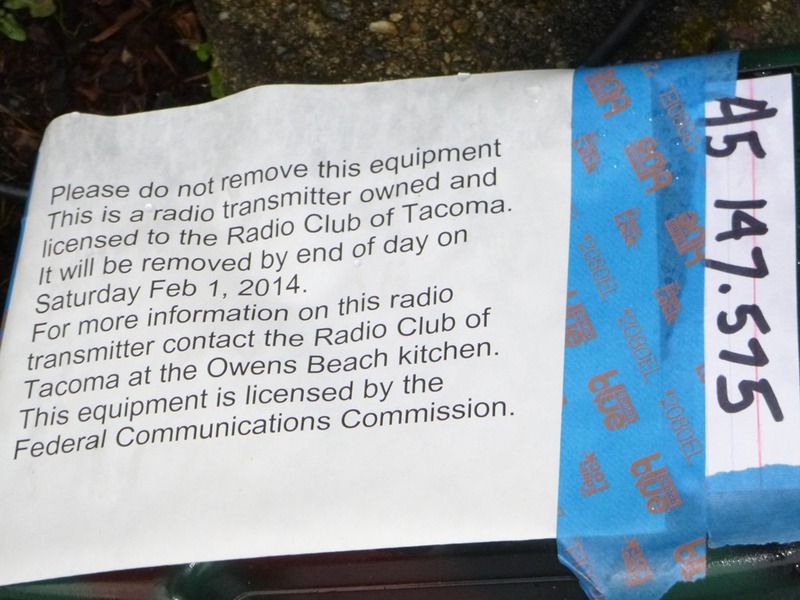 After about 15 minutes of walking, I started wondering if we walked too far… The beach walkway was very narrow, but the transmitter could have easily been hidden in the nearby woods along the walkway and we could have walked right by it. The antennas that we had only showed that it was lined up with the signal…but it didn’t tell us if the signal was in front of us or behind us. This is when I started thinking about an interesting book I’m listening to right now called How Children Succeed. 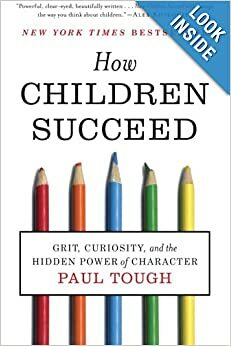 The primary premise of the book is that character is a far better predictor of children’s success than test scores or IQ. Yet, we have essentially built our school system entirely around test scores, and there’s almost no attention given to teaching character to our children in a systematic way. When you go to the Washington State Office of the Superintendent of Public Instruction, the primary measures for schools are standardized test scores. When you go to greatschools.org, their rating are based purely on test scores. This is not to say that school teachers don’t try to teach “character” individually in their classrooms, but it’s not tracked or measured in any meaningful way by the school, districts, states, or other third parties. What if we could measure how each school instills positive character traits in their students. One of the ideas in the book is that they make a distinction between “moral character” and “performance character”. Moral character attributes are things like honesty, kindness, and empathy. “Golden Rule” type attributes. These character traits are also mired in controversy because there’s a value judgment involved that often has its foundation in faith-based culture. Needless to say, teaching “moral character” is a tough one for everyone to agree on in a school setting. Performance character attributes are things like resilience to failure, optimism, self-control, and grit. These attributes are typically universally valued and are not as controversial. The book goes through study after study of correlating between “performance character” and success (measured in various ways). But as a parent, how do you teach things like “grit” to your kids? Walking ever longer and longer on this seemingly endless beach walkway with Andrew, I was thinking about this very question. After about an hour of walking, I was on the brink of giving up. We had long passed the end of the beach walkway. 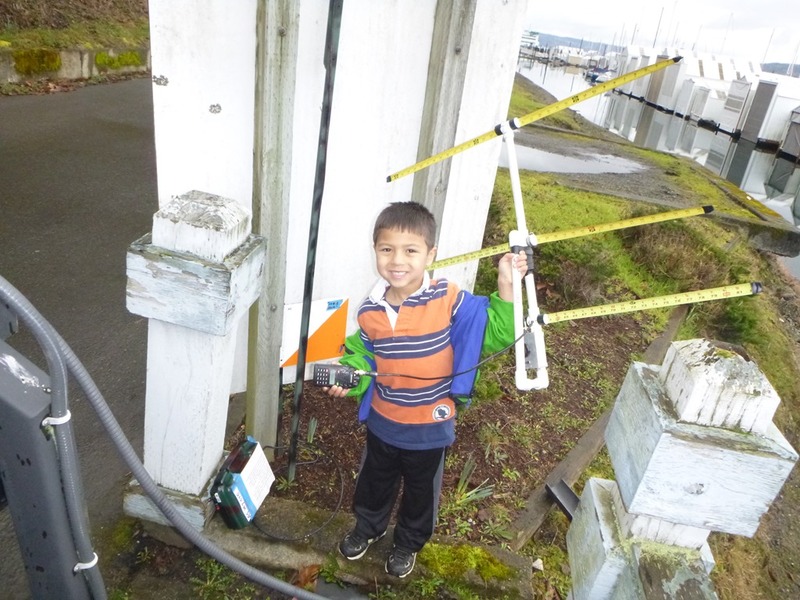 We went through the Tacoma Yacht Club parking lot, and we were starting to approach the end of the park. Andrew was also getting pretty tired and starting to ask if we should just turn around. I think I probably would have quit if the book I’ve been reading wasn’t foremost on my mind. I gave Andrew a quick pep talk and asked how cool it would be if we could go tell the guy at the radio station that we found it! Even if it was super far away. Even though it was super hard! He probably doesn’t think we’re going to get it. But, we can! We will! He was re-energized and we kept walking. 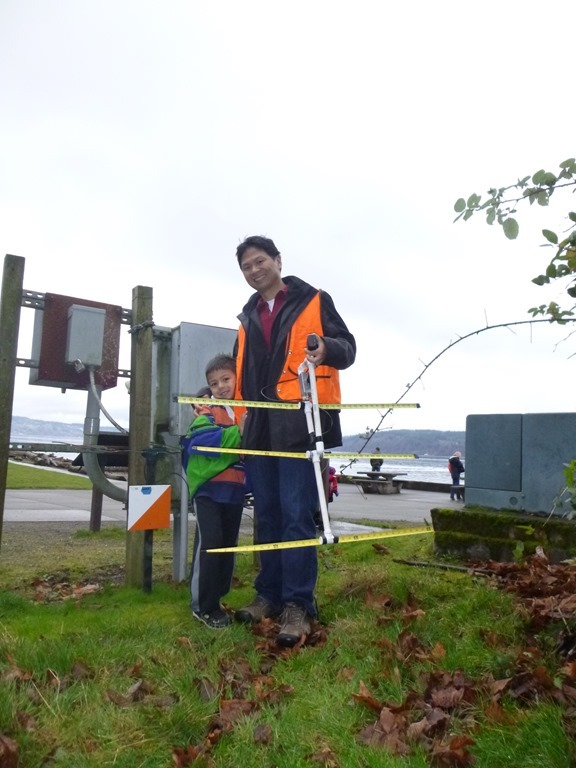 It was probably another 15 minutes of walking when we got right to the edge of the park and found the transmitter behind the parking gate. We were both super excited that we finally found it. But in my mind, I was also dreading the long walk back. We took a little break and took some pictures. Then, started the long walk back. The walk back wasn’t nearly as bad as I thought. For one thing, we didn’t have to stop every 30 seconds to take sweeps of the signal. Also, I think when I was second-guessing myself the entire time wondering if the transmitter was behind me, my pace was probably pretty slow. In the car, we called Tenille and Andrew exclaimed over the speakerphone with pride how we found the two’th (second) transmitter… and how difficult and far it was. 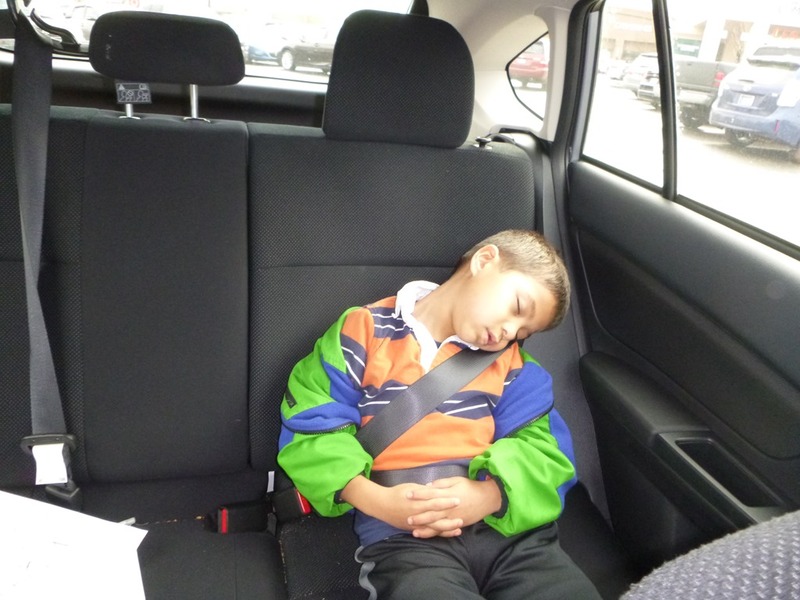 Then, he promptly fell asleep… The experience was fun and I’m hoping I can take our cub scouts to do it again. And it was a timely experience as I’ve been thinking about how to teach “grit” to our kids in a productive way. The idea of teaching persistence is still one that eludes me. I haven’t been able to deliberately and systematically think of ways to teach “grit” or persistence… but just recognize that some activities may be good for developing those characteristics. 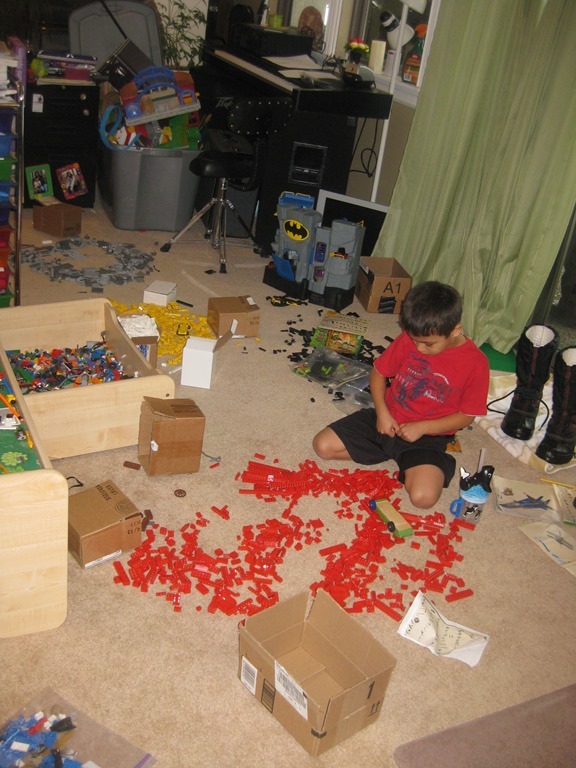 One thing that the kids started doing was re-organizing their Legos. Every year, both Caleb and Andrew probably receive as gifts or buy 6-7 lego sets. All together, they probably have over 30 sets of legos mixed together in a gigantic Lego vat. Recently, they’ve been trying to re-organize the legos back into their original sets. “What a colossal waste of time!” was my first reaction. But, they were very into it. It was kind of like searching for puzzle pieces. I was a bit surprised as they have put back together several sets and have a whole bunch of partial sets started. When I started to help them, I found that this was definitely an exercise in persistence. Don…entertaining, as always. I think the hardest part about building “grit” is letting your child tackle something you know they will fail at…and letting them do so. Keep ’em coming.